Point your camera downward when changing lenses so that dust particles are less likely to settle into the mirror compartment. 2Don’t provide dust with a safe haven. 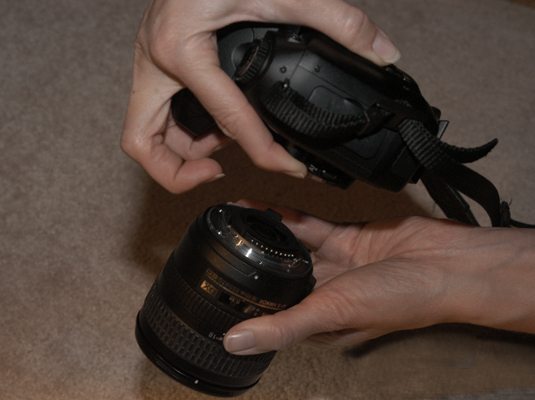 Clean and dust the mounts of your lenses and the rear lens before you attach a lens to your camera. Try to change lenses in relatively clean environments. Avoid dusty rooms or gusty outdoor locations. 4Minimize the time your camera is lenseless. Have your new lens ready to mount, with the rear cap off but placed loosely on the back of the lens. Then, remove the lens already on your camera, set it down, and immediately take the rear lens cap off the new lens (set it on the back of the old lens if you can do it quickly). 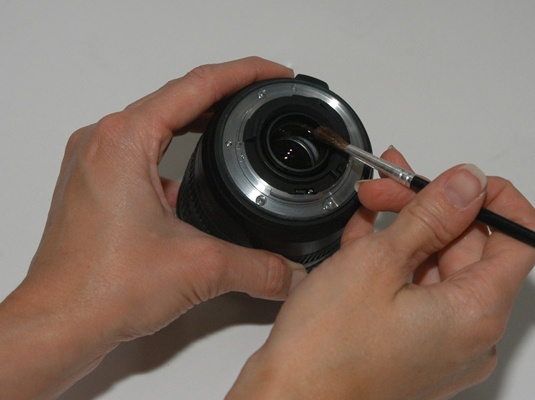 Then pick up the lens to be mounted and fasten it as quickly as you can.